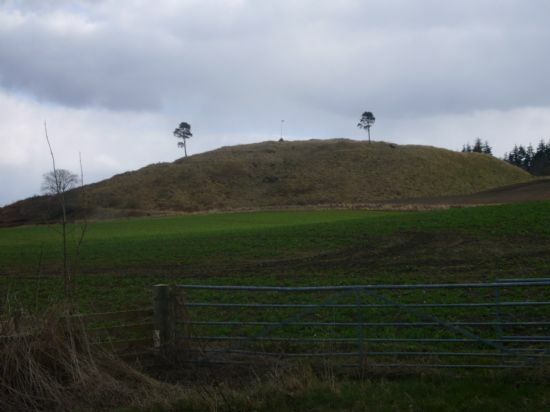 On a hill outside of Avoch on the Black Isle is a mound surmounted now by a cairn and flagpole. This is the site of Ormond Castle, a little understood Medieval enclosure castle. 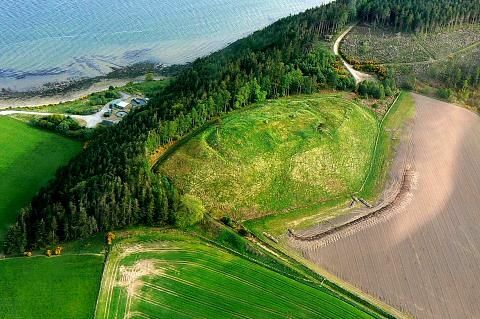 It is traditionally associated with William the Lion who built two castles on the Black Isle in 1179, one at Redcastle and the second thought to be this one. After being in the hands of the de Moray family and the earls of Ross, it passed into Royal control in 1455. In 1481 James III granted it to his son, the Marquis of Ormond, from whom the present name derives. The site commands good views to the south and west, towards Avoch and the Souters, and the ferry crossing between Chanonry and Ardersier. Little remains of the castle today except for foundations, because it was destroyed during Cromwell’s invasions in 1650, with the stones then said to have been used by Cromwell to build his Citadel in Inverness. By the time of the New Statistical Account in 1845 it was ruinous, with only the remains of three breastworks with median ditches. east can still be seen the foundations of a large rectilinear building. There are also earthworks around the northeast, reminiscent of those found on some Iron Age forts suggesting the possibility that the site may have earlier occupation, in the same way that Urquhart Castle was built on a site previously occupated in the Iron Age. In recent years a flagpole, cairn and plaques have been erected to Andrew de Moray, owner of the castle in the 13th century. He was active against the English in the Scottish Wars of Independence in the late 13th century, fighting with William Wallace at the Battle of Stirling Bridge, where he was wounded and died shortly after. The memorial at Ormond Castle was erected to highlight the actions of a figure thought perhaps not to have the recognition he deserves. An annual event now commemorates the rising of the standard. Further investigation on this enigmatic site is planned by North of Scotland Archaeological Society (NOSAS). Beaton, A J. 1884-1885. 'Notes on Ormond or Avoch Castle, in the Black Isle, Ross-shire, with a plan and section; and notice with drawing of bronze celts found in its vicinity', Proceedings of the Society of Antiquaries of Scotland 19, pp.400-5. Available on-line. 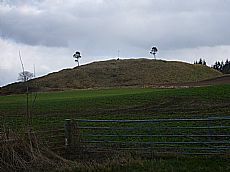 The site was visited on a joint walk by ARCH and NOSAS in March 2013, accompanied by Eve Boyle and Piers Dixon of the RCAHMS.